Age: To apply to B.Tech program the candidates must be born on or after 1 October 1997. Please note that the university will only consider the Date of Birth recorded in the High School/Secondary Education Board/University Certificate. Academic Criteria: The candidate must have passed the Class 12 Exam in 2016, 2017 or 2018. Since the B.Tech admissions are done on the basis of JEE mains, the minimum academic qualification for the programs is as laid down by JEE. The candidate must have passed class 12 (or equivalent exam) with a minimum of five Subjects including Physics and Mathematics as a compulsory subject. Required %age in the qualifying exam: The candidate must have obtained a minimum of 60% aggregate marks in three subjects viz are; Physics, and Mathematics (Compulsory) and one subject amongst Chemistry, Biology, Biotechnology, Computer Science, informatics practices and multimedia and web technology. For Bio-Technology Students: Candidate must obtain a minimum of 60% aggregate marks in three subjects to include Physics, and Biology/Biotechnology (Compulsory) and one subject amongst Chemistry, Mathematics, Biology/Biotechnology (whichever is not chosen as core), Computer Science, Informatics Practices and Multimedia & Web Technology. The candidates whose class 12 result is likely to be declared on or after July 15, 2018, will not be eligible to apply for the 2018-19 academic session. The minimum academic qualification for admission shall be a pass in the 10+2 or its equivalent examination in India or abroad including International Baccalaureate (IB) students. Physics and Maths shall be treated as compulsory subjects. The candidate must have secured a minimum of 70% aggregate marks in the qualifying exam. The equivalent marks of IB students shall be derived and verified as in Cambridge Examination system. Marks equivalence to be certified by AIU in case, of the candidate having studied abroad. For NRI Candidates: The candidates must have secured a minimum score of 1800 (as per old SAT) and 1200 (as per new SAT). Bennett University Applications can be filled and submitted "Online" as well as "Offline". 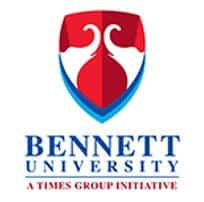 The candidates who wish to apply for B.Tech in Bennett University can fill the Bennett Application Online from the link which will be given below or they can also purchase the Bennett University Application form from the University itself. Follow the link given below to apply for Bennett University B Tech Admission 2018. Online Payment: The candidates who have filled the application form online can pay the application fee using net banking/credit/debit card. Such candidates can also opt to make payment through bank draft on University’s website. Demand Draft: The demand draft of Rs.1000 must be drawn in favour of Bennett Institute of Higher Education, payable at Noida/Delhi. The candidates filling the application form should ensure that the details filled by them are correct in all aspect. The duly filled application form along with DD (if applicable) whether purchased or filled online has to be sent to the following address. The annual fee structure for the BTech course in Bennett University is given on this page below. The fee structure for the BTech course consists of the Registration Fee, Tuition Fee, Hostel Charges, Security Deposit etc. Institutional Fee: US $7000 Per Annum. Chancellor's Scholarship: All students enrolled in Academic Session 2018-19 will be given Chancellor scholarship of Rs 50,000 on the annual basis. Bennett University B.Tech Result: The University merit list is expected to be declared on the third week of June 2018. The candidates can check the merit list on the official website of Bennett university. The selected candidates will be called for counselling (allotment of seats). Counselling schedule will be available on the official website of Bennett university. The selected candidates will also be intimated on the email provided by them while filling the application form, however, the candidates whose name has appeared in the merit list are advised to keep a tab on the website. The First round of Bennett Counselling will be conducted by the end of June 2018. The details regarding counselling are yet to be announced by the university. For now, the candidates can expect counselling to be either online or at a specified venue. The candidates will be allotted seats on the basis of merit list. Initially, the candidates given provisional admission, the candidates are required to produce proof of having passed the Class 12 or equivalent to the University authorities during document inspection at the time of the counselling/ registration, failing which, such provisional admission will stand cancelled. The merit list of the candidates will be drawn on the basis of actual marks scored them in JEE (Main) 2018. Please note that JEE Marks in any category or state, etc will not be taken into account. The merit list for SC/ST/J&K candidates will be prepared by applying the cut off 10% below the total marks in JEE (Main) 2018 exam obtained by the candidate shortlisted in the general category. Out of the total number of seats in BTech programme of Benet University, 15% of the total seats in all the branches have been reserved for the NRI/Foreign candidates, thus there will be 80 Seats in all B.Tech programmes which are reserved for Foreign Nationals and NRI candidates.